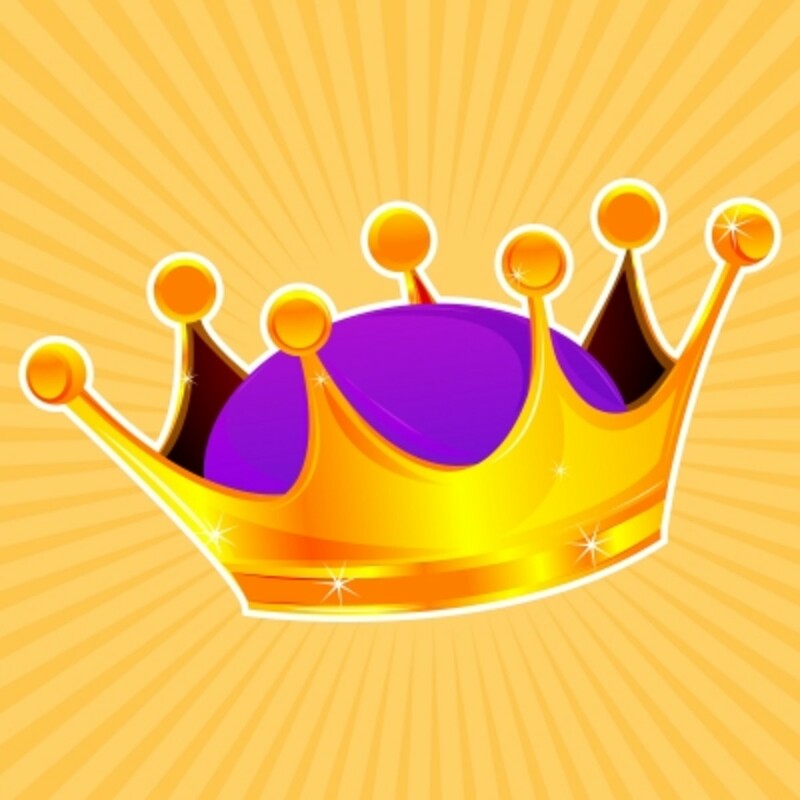 The Millenial Kingdom - God is in Charge! After Jesus wins the Battle of Armageddon, Satan is bound and Jesus begins his 1000 year reign on earth and lives physically with His people! The Battle of Armageddon is over. Satan has been defeated and his forces destroyed. The earth has been literally ripped apart by 7 long years of the Tribulation. The dead number in the millions and millions. Evil is gone, at least for now. The Antichrist and False Prophet have been cast into the Lake of Fire. Satan, still alive, has been chained and thrown into the Abyss for 1000 years and will be released at the end of that time to be dealt with forever. I welcome you all again the my series on the book of Revelation. We began with The Rapture, went through the 3 sets of Judgments that followed, the Seal, Trumpet, and Bowl Judgments, then we saw the Battle of Armageddon when Jesus and Satan met and fought. Now that the battle is over, Jesus, as prophesy foretold will begin His reign upon this earth. A new city, The New Jerusalem will descend from Heaven where Jesus will live among His people, rule with an iron hand, and God's people will be able to live in peace and joy. If you haven't read the other articles that I have published, I invite you to do so in the order listed above. Reading these events out of order may confuse you. That is definitely not what I want to do. God gave us Revelation so we can know what is going to happen and be prepared for it! We can't even truly imagine how wonderful the Millennial Kingdom will be, but God does give us some idea in Revelation 20. The heavens and the earth will be destroyed and created anew after the 1000 year reign. Finally, paradise is regained on earth. Jesus reigns for 1000 years on the earth, then it will be destroyed and remade. The lion shall lie down next to the lamb. 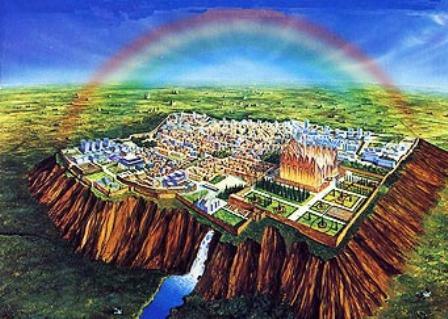 Artist concept of the New Jerusalem, an actual city where Jesus will reign upon this earth. A new heaven and a new earth will be created. 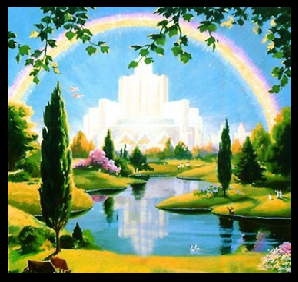 The New Jerusalem....another artist's concept. 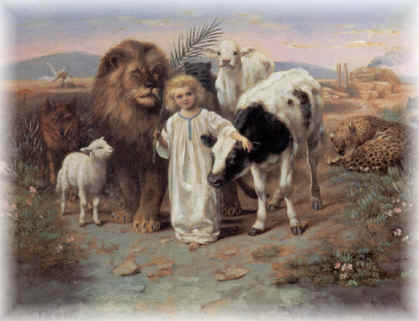 In Daniel 7:13-14, it states that the Second Coming marks the beginning of the reign of God’s kingdom on earth. 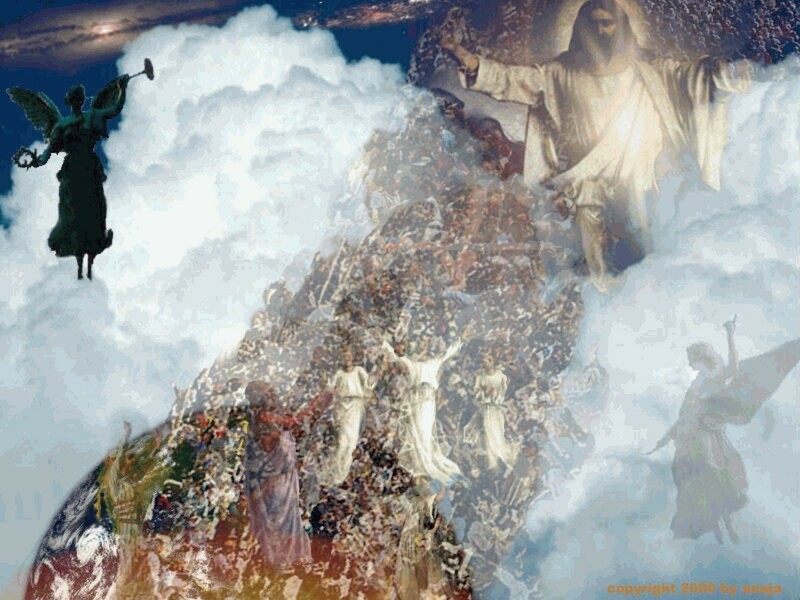 As explained in my hub or the Battle of Armageddon, Jesus descends from Heaven with His army of saints, angels, etc. and destroys Satan and his forces, thus ending the The Tribulation Period. Jesus will set up His Kingdom on Earth and will dwell in the city called New Jerusalem. This city will be massive, 1500 miles on each side and Jesus will rule for 1000 years from this beautiful city! This passage makes it clear that this event will take place in the future. In the New Testament, in addition to prophecies concerning the Second Coming, the Rapture of the Church is revealed for the first time. The Rapture of the Church is when Christ will come to take the church, believers living and dead, out of the earth to Heaven. It is an event entirely different from the Second Coming. This confuses many people since the Rapture occurs first. Only believers are affected in the way I stated, but Jesus will not be seen by unbelievers. Only those saved and believers in Christ will see our Lord in the air, meet him there, and go to Heaven. All unbelievers will see are that millions of people vanished into thin air! I personally believe that since only believers can see Jesus in the air when the Rapture happens and nobody else can. He will be alone this first time. 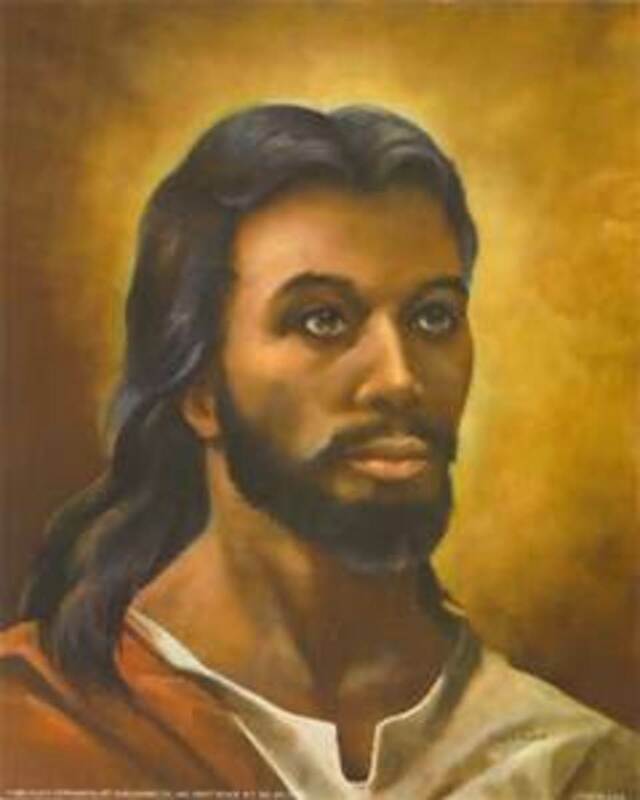 Scholars have determined that this is why this appearance of Jesus is not referred to the Second Coming. 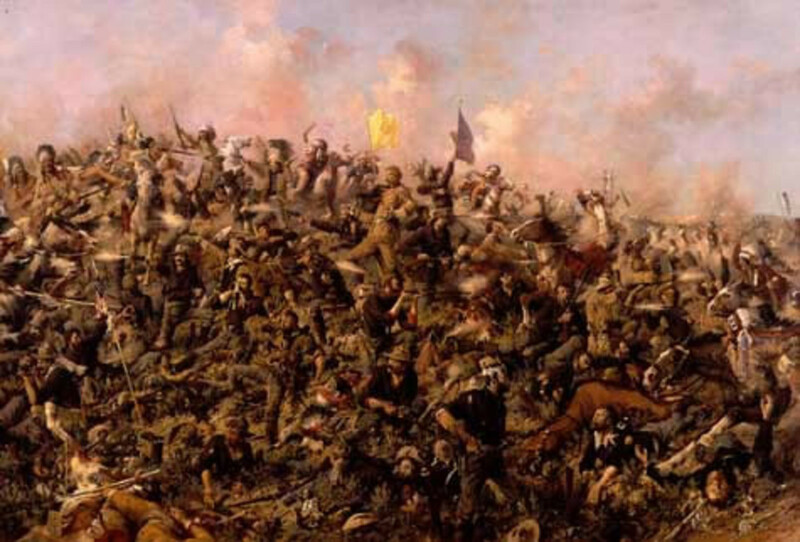 When Jesus appears to ALL before the Battle of Armageddon, the term Second Coming is used. Jesus comes back not alone, but with all of Heaven behind them. So, there will be two appearances of Jesus, the second one being called the Second Coming that ALL will see and experience! After the Second Coming and Battle of Armageddon, a series of judgments takes place. 1) Satan is bound and thrown into the abyss. He is still alive, but unable to do anything during Christ’s reign on earth. 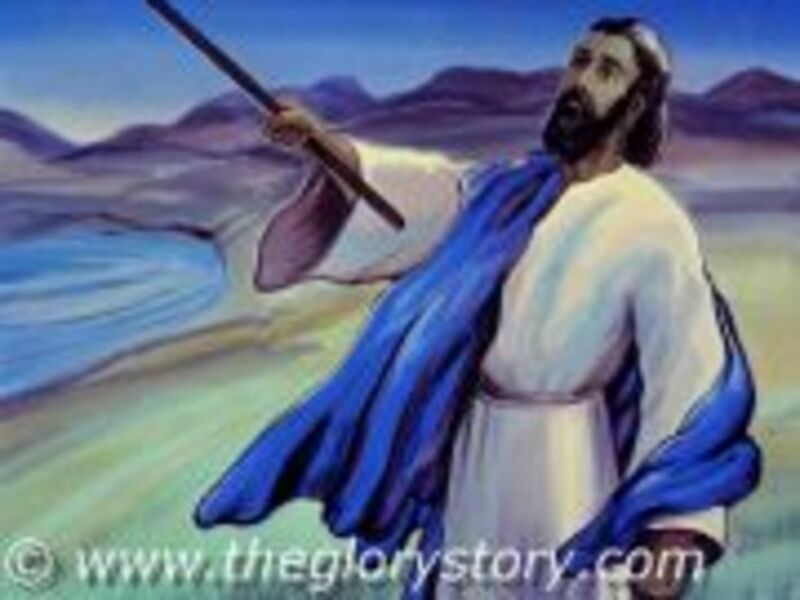 2) John recorded seeing the resurrection of the Tribulation Saints, the ones that died during the Tribulation. 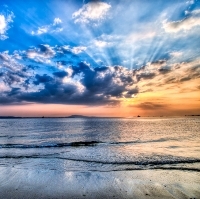 (Revelation 20:4-6) These saints will be judged and rewarded similar to those at the Judgment Seat of Christ. 3) Scripture speaks of a judgment of nations, or the Gentiles (Matthew 25:31-46). This is for those Gentiles that are alive at the end of the Second Coming; those that survived the Tribulation. Those counted worthy are described as sheep and will be able to enter the MillennialKingdom. Those designated as goats will be considered unworthy and put to death. A similar judgment of the people of Israel also happens. (Ezekiel 20:33-38) But what about the resurrection and judgments for those Old Testament saints revealed in Daniel 12:2)? In summary then, at the start of the Millennial Kingdom, ALL the righteous will have been raised from the dead, and those living, Jew and Gentile, who survived the Great Tribulation will enter the Millennial Kingdom in their natural bodies and will do natural functions. Only the wicked are still in the grave and not resurrected at this time. So, what is the Millennial Kingdom going to be like? The Bible speaks of it in various forms, sometimes referring to our world and sometimes as a spiritual kingdom. The Millennial Kingdom is an earthly kingdom with Christ on the throne who is has absolute control. This will fulfill the promises that He will sit on David’s throne over the house of Israel. He will be their King. Of course, when Jesus came the first time, Israel rejected Him and the Cross was posted that He died as a King. Now, He is the King over the Davidic kingdom fulfilling the prophecies concerning this. 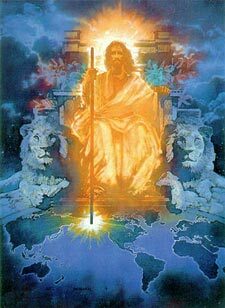 Again, He is reigning over Israel as the Son of David, but also as King of Kings over the entire earth including the Gentiles. (Psalm 72:8). All who oppose Christ will face judgment. Justice along with righteousness will be prime characteristics. Nothing like the corrupt government in our world today. Psalm 2:10-12 speaks of His wrath and in Isaiah 11:3-5, we get assurance that the poor and meek with be dealt with righteously. Because those that enter the Millennium are either resurrected saints or people who have been born again, the early stages of the kingdom there will be a righteous manner of life such as the world has never seen. There will also be a high level of spiritual life. Jesus still reigns in His followers’ hearts, but will now be universal and visible. Since He will be visibly present in the world, all will be able to see His glory and be filled with it. Full knowledge of God and His ways is indicated in Isaiah 11-9. God’s Truth will be in the hearts of mankind and all will know the facts of Jesus. (Jeremiah 31:33-34). He will forgive sins and pour out His blessings on them. These 1000 years will be full of peace. There will be no war and all personal relationships will be peaceful. No nation will take up sword against another, or will men be trained. There will be universal joy as stated in Isaiah 12:3-4. The power of the Holy Spirit will be working too. Saints will be indwelt by the Holy Spirit just as it is today. God is going to live physically in His Holy City. There will be a huge temple there, so worship of God will occur and there will be sacrifices. These animal sacrifices are different from those in the Old Testament. They will not pay for sin, but will be a reminder to look back to the Cross for the ultimate sacrifice. Many have disagreed with this idea of animal sacrifice stating that when Jesus died, it was sufficient for ALL sin. But in the book of Ezekiel 40: 1-46, there are details about the sacrificial system in the MillennialKingdom. Only saved people will enter the Millennial Kingdom, but those born there will need to receive Christ as their Savior and be born-again. You would think that with Satan bound and and that there is universal knowledge of Jesus that this would not be needed, but at the end of the Millennium, there will be a rebellion by those that are not saved. There will be great prosperity, no poor people or any suffering from lack of necessities. When God cursed the ground in the Garden of Eden, that curse will be lifted and even the desert areas will be fertile and produce crops. The twelve tribes of Israel will have its designated portion of the Promised Land as stated in Ezekiel 48. There will be true justice finally for all. Since the earth’s population was practically wiped out during the Tribulation, there will be a large population boom. 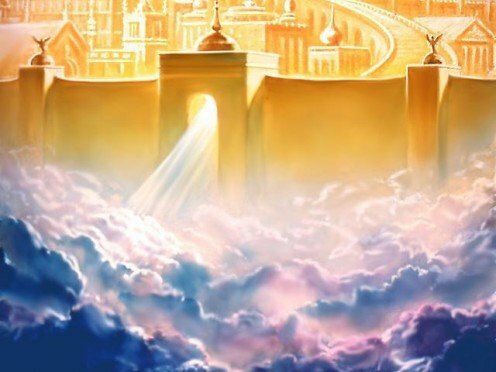 The New Jerusalem that descends from Heaven will be exalted as a city and actually rise about the surrounding land. It will be huge… a cube shaped city 1500 miles long on each side. It is said that some of the old landmarks will still be there, such as the Benjamin Gate. (Jeremiah 37:13). Hi Sgt.Pepper. Thank you for stopping by and leaving a comment. All one has to do is turn on the news to see Satan's hand in today's world. Terrorism, corruption, evil at every turn and Christianity being attacked on every front. Social media is also one of Satan's stronger tools, along with many so called 'benevolent societies'. The end days are definitely here and hope our Lord comes soon to end this for good. Just seeing the 2016 campaigns is frightening. Totally out of control and nobody has the backbone to stand up for the Truth and turn this country around. I am just glad I am saved and will see justice done. God Bless You! The prince of the power of the air is using secret societies big-time. See the Freemason/Illuminati Covenant, The Bankers Manifesto of 1892, The Jesuit Oath of Ordination and of course the Protocols of Sion! The Bush brothers, the Clintons, Paul Ryan, Kenyan-born BHO, Canadian-born Cruz & former Israeli dual-citizen Bernie Sanders are all in on it. The NWO is almost complete. I hate Big Brother. Thanks WMH...it is so easy to allow Satan to keep my focus away from God and the way to peace and rest. How I would like to clobber him with the business end of my foot! I know that the Bible says that our 'treasures', our real treasures that last forever are in Heaven, but sometimes we need something in our present lives to keep us going. Maybe if we could 'sneak a peek' at our heavenly treasures....hmmm.....LOL I know if we were given even the smallest, tiniest, glimpse of Heaven and/or our rewards, it would completely overwhelm our human senses...probably strike us unconscious. I have been praying this for a very long time. Each year that passes gives me one less year to share my life with someone special. Even though married twice, I never have experienced what a marriage SHOULD be, just some phony imitation where I gave and got nothing but pain and rejection back. My patience is wearing very thin, especially when I see other couples enjoying each other while I am still wandering around searching like some loser. People notice that and it is very discouraging like, what is wrong with him, etc., etc. I guess I am just tired of waiting for a blessing while others that don't even believe get blessing upon blessing. I figure I have had this desire going on almost 60 years now, and still am where I was...alone and unhappy, why bother? I know that is not Biblical, but I am just fed up with disappointment, year after year. Thanks, Skye. Guess I will keep trudging on, but like Paul, long for the race to end so I can have peace at last. Brother God is going to have His way. He always does. Why don't you pray and ask Him to send the perfect Godly Woman that is out there for you. Ask Believe Receive and do not waiver in your heart no matter how it looks. Start thanking Him that the woman of valor lands in your path. If God does the picking it is sure to be good and very good indeed. Praise God He hears your prayer. In His timing. He has work for you in the mean time. It is going to be all right. God is large in charge and knows what is best for His child Dave. Love you knightheart. Now don't you go beat up my brother in Christ, knightheart. You hear?? Be good and gracious to him. Bless others that's what you do best and God will Bless you in abundance. Hugs Bro. Your sis loves ya. Hey Skye, Thanks for coming by and seeing if all the pieces have been picked up. Went out last night..the first time in a long time and has some fun. But, the woman and I just didn't click...again. Sure don't know what it is that I do or say that turns them off, but what can you do...nothing. I do know that meeting one time in person is not what you should base something on for the future. After all I was a bit nervous since we had never met, so of course am going to be more tense and unsure of myself than normal, but it just seems everyone has to rush, rush, rush and do not give something this serious more than 1 shot. That isn't fair, but it happens everytime. Hi Sis! So good to see you here again. I have sure had a rough week...attacks from Satan from almost every conceivable direction...my personal life, my work life, health, everything. If I didn't have God's armor on I would be sunk for sure. I admit, just being equipped with His armor is not enough...it has to be used! And that was my shortcoming last week. I just realized that when I was teaching my Sunday School kids about the armor of God. When I told them it isn't good enough to just have it, but you have to USE it...well, the Holy Spirit konked me over the head and said, "Hello...anyone home?" Sure enough, I dropped the Shield of Faith and just let the Sword of the Spirit hand useless in my hand. No wonder Satan's fiery darts had me flat on my face in despair. Even as a believer you fail and boy, did I fail last week..in almost everything I did. Thank you for commenting here...you always know what to say to me to help me. I wish you were single because I would snap you up in a second...your lovely soul and heart just touch mine so easily. I know your husband knows what he has and he appreciates you and loves you completely. He is truly blessed! I am closer to you by friendship more than the people I see everyday...guess that is what they call Kindred Spirits. All I know is that I thank God for you Skye...you are just so awesome and you have pulled me out of the mud more than you know. I know earthly love fails and no matter how hard I try or want it, it will never be enough to match God's love. Thank you again for pointing my head in the right direction...TOWARDS God. Even with all that I know, I still turned away and got nailed for it. I can't wait for Jesus to come back. I want to live in peace and complete love...no more tears and heartache. I just can't take that anymore. My faith isn't as strong as it should be and that is my fault and the reason for all my trials right now. I do know I have one treasure here, and that is having you as a friend. That is beyond value to me. If God can give my your friendship on this earth, I can't even imagine what treasures we will have in Heaven. I just know I am going to give you the biggest hug I can...you just are unbelievable!!! Thanks for your kind words and support. Being alone it today's world is not easy by any definition. knightheart Hello Brother. There are so many different interpretations of the Rapture and so on. The intrepretations I speak of know Jesus as Lord and are saved. Many are very studied in Scripture. Most seem to have a bit of difference in all areas of Rapture, 1000 years so on. I just know for me, Praise GOD alleluia I know where I am going and need to be about my Fathers business. Sharing the good news of Salvation. DO I agree 100% with your hub no. Parts of it, yes. For me it is worth asking God for wisdom in understanding and knowledge where I am not certain. You picked a topic where you could get much slack, as you know. Love never Fails hey? Awesome work for Christ. LOST SOULS Jesus is going to return! Believe and Be Born Again and repent of sin so you will be spared death, seperation from God forever in the dark and evil. Jesus is the way, truth and Life. Amen. You do NOT want to miss the wonderful amazing awesome, everlasting life in the light with the King of Kings Forever where there are no tears no pain no suffering. Amen Bro. Our treasures are stored up in heaven We will be rewarded for our works. Amen bro. You will have many treasures. I hope and plan to put many more in store. Hugs Galore Come Soon Jesus Come. Love the pictures. I don't believe so. Wow, I sense some hostility. Why is Satan released at the end of the 1000 year reign then. He is not eternally damned until after that period. Sin is totally gone when the New Heaven and Earth are created. If there was no sin, why create a new heaven and earth? Knightheart: You are wrong! Once sin and death, and hell are cast into the lake of fire, sin will be "NO MORE" so the newborns will be born sin-free and know only Jesus the Holy Spirit and of course Father God. Satan and sin will never see, nor visit earth again. Hey Dave! I guess I wasn't clear on that. I was referring to Satan's defeat at the Battle of Armageddon and that the False Prophet and Antichrist are gone. Satan is now bound and cast into the Abyss. All the unbelievers are gone and only those that are Children of God will be with Christ. Of course, during the 1000 year reign, people will be procreating and these new people will still have to deal with sin since the New Heaven and New Earth haven't been created yet. Until Satan is completely destroyed at the end, evil will make another appearance during those years. But this time, Jesus will be in charge and His Justice will be perfect. Thanks for you comments, my friend. God bless you! Knightheart: Why in your opening paragraph do you say that "evil is gone at least for now." The Bible does not tell us that it will be loosed upon mankind ever again? 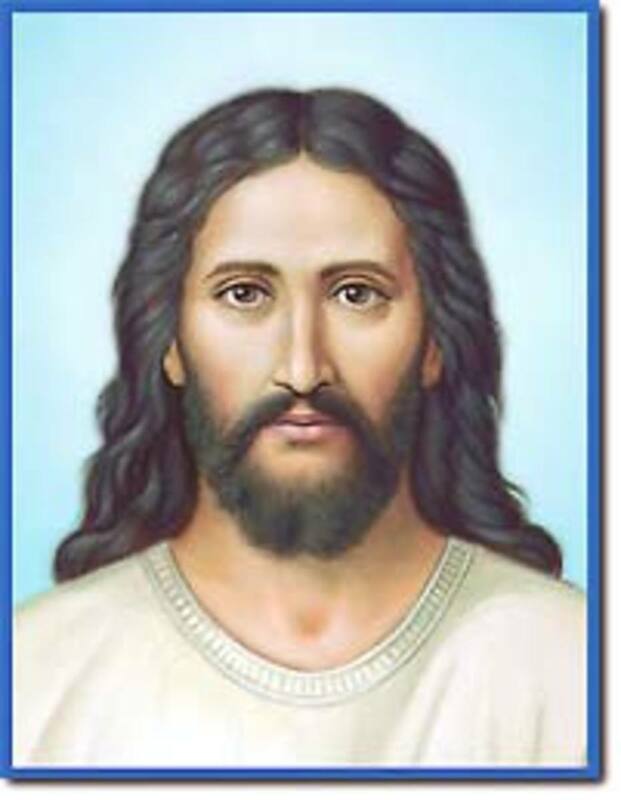 Indeed Jesus will rule over man on earth for a thousand years but then He will turn over Earth and its inhabitiants to The Father who will live and dwell amongst His people for ever.